15% OFF supplements for those who attend the class! 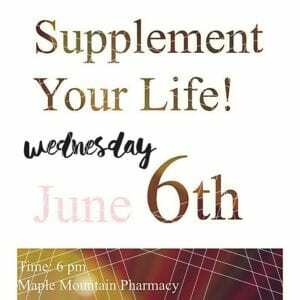 This class will go over some of the major supplements that will take your quality of life to the next level, such as vitamin D, multivitamins, probiotics, fish oil, thyroid support, diabetes support and more. Some of the benefits of supplements include decreased pain and inflammation, improve mood, increased metabolism, and a more positive outlook on life! 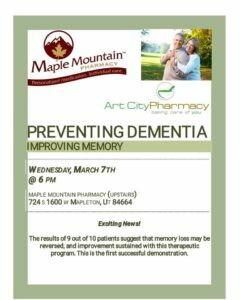 Feel free to call the pharmacy with any questions! 6 pm Here at the Pharmacy! 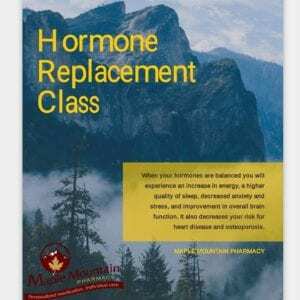 When your hormones are balanced you will experience an increase in energy, a higher quality of sleep, decreased anxiety and stress and improvement in overall brain function. It also decreases your risk for heart disease and osteoporosis. March 7th @ 6 pm! 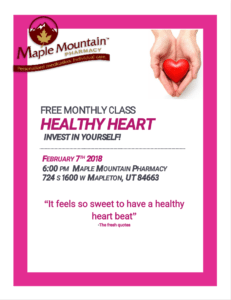 Location: Right here at Maple Mountain Pharmacy! October is American Pharmacist Month! Get a flu shot this year! We’ve got what you need to help kids of all ages feel their best going back to school! Don’t Wait. Vaccinate! Make sure your child is up to date on their immunizations before heading back to school. Be Safe Outside This Summer! Play it Safe: Before letting the kids play, check the area for potential hazards such as sharp edges, rotting wood etc. that can cause injury. Watch out for Poisonous Plants: Be able to recognize poison ivy and other poisonous plants to avoid those areas. Beat the Heat: Dress for the weather, apply sunscreen regularly, schedule outdoor activities for morning or evening hours. Don’t forget the allergy medications and itch creams too! • Men make 1/2 as many physician visits for prevention as women. of the elevator. Do yard work. Play a sport. Keep comfortable walking shoes handy at work and in the car. Most importantly, choose activities that you enjoy to stay motivated. Make Prevention a Priority. Many health conditions can be prevented or detected early with regular checkups from your healthcare provider. Screenings may include; blood pressure, cholesterol, glucose, prostate health & more. You spend a lot of time taking care of others. NOW is the time to empower yourself and make YOUR health a priority! 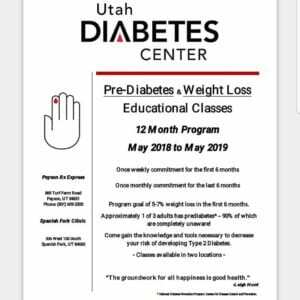 Many people have no symptoms 9 out of 10 people don’t even know they have prediabetes. Get your blood sugar levels checked today to find out if you’re at risk. Stop in and take the quiz today! If you’re 50+ get screened! Colorectal cancer screening saves lives. Early detection is one of the keys to prevention. Every year, about 140,000 Americans are diagnosed with colorectal cancer. This disease is highly preventable! Stop in today to learn more about prevention and early detection! High blood pressure is more common than you think! One in three (67 million) U.S. adults has high blood pressure or hypertension. High blood pressure is a major risk factor for heart attack, stroke, kidney disease and diabetes complications. Heart disease can often be prevented when you make healthy choices and manage your health conditions. We can work together to create a healthier lifestyle & prevent heart disease. 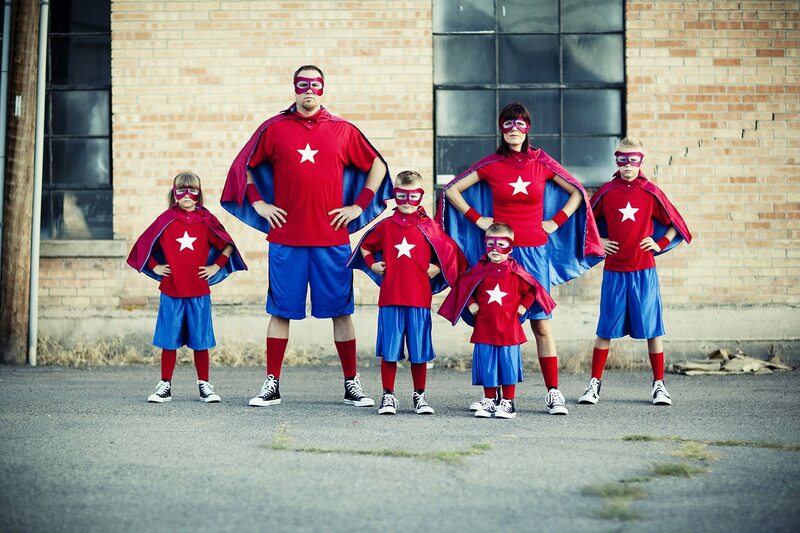 Be a Superhero – Get a Flu Shot! No appointment necessary just stop on in when it is convenient for you. Many insurances cover the flu shot and we would be happy to check yours for you! Be sure to get yours before cold and flu season hit. You’ll be glad you did!